Nick Bastis stokes and redirects the familiar to generate synaptic points of overlap that hint at subversion and untapped latent potential that extend between objects, architecture and the viewer’s body. The vastness of space between objects in this exhibition is symbolic of the immaterial intellectual labor that produced these variations. 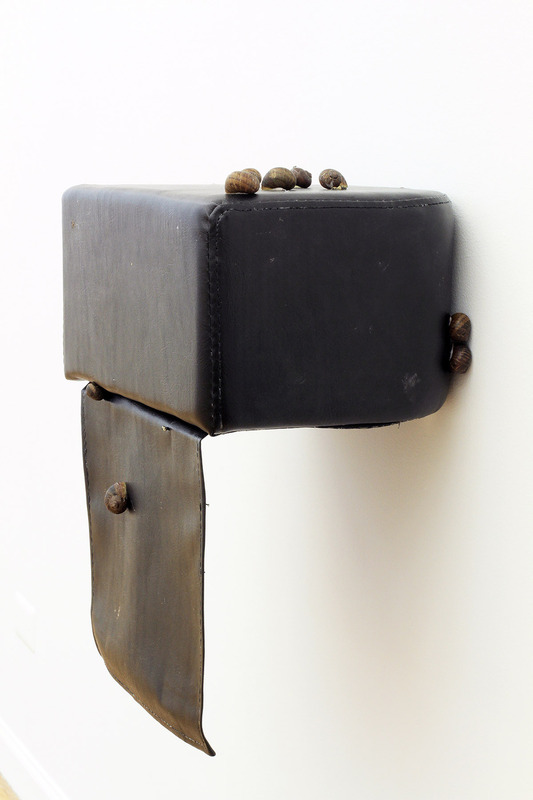 The installation’s focal point is a black vinyl seat mounted to the wall upon which a dozen snails are perched. While the snails are in hibernation, residue and excrement act as drawings. An ambient soundtrack is mixed to maximize silent gaps between condensed sound bites of echoing cheers, rattles and pops, disorienting the viewer yet achieving continuity between the vinyl seat and other objects installed in far-flung corners of the space. Echoes become lines in space that evaporate and re-assert themselves in a productively awkward syncopation. The combination of sparse tableau with the audio maps a diagram of temporal experience onto the architecture of the gallery itself, which extends beyond the gallery walls to a sculpture installed in the adjacent alley outside. Time itself becomes disjointed: perpetually on repeat, simultaneously on pause yet frenetic. 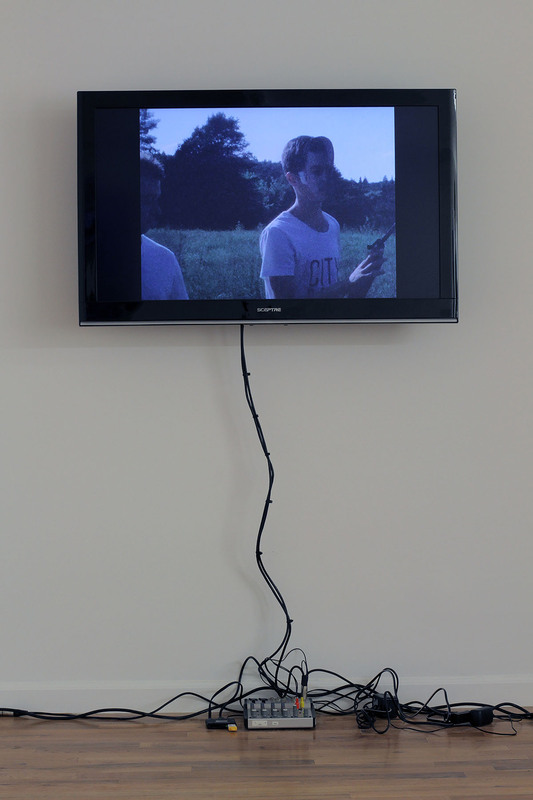 In the looping video, “3 become 1 and so on and so forth,” 2014, a jostling hand-held 16mm camera captures three young men engaged in casual target practice. Two men are wearing masks of the third’s face. Jump cuts move from the three men, to three trees, to three protruding municipal pipes emerging from the ground. Each subject in this video becomes an anthropomorphic set piece reinforcing the anonymous identity of the three men. The viewer is asked to consider tautology as a relationship where disparate yet redundant parts are rendered identical. Each vignette neither empties out nor achieves a satisfying reveal much like the exhibition at large. Through March 7 at Regards, 2216 West Chicago.